Tuesday, I wrote a post dedicated to those women who have already raised their children well. It was my way of begging these amazing moms to be nice, and leave a legacy of grace for those coming behind them. Sadly, it doesn't always happen that way. Sometimes, older moms feel the need to crucify rather than edify. Right after the post went live, I received an email in response from a dear mentor mama in my life. Funny thing is, I only just met Jan Skaggs a couple of years ago, and she lives in Austin, TX. It's not like I get to see her every day, or sit on her (amazing) front porch and sip sweet tea as we talk about life. But since I first met her, she has deliberately pursued me with grace, taking every opportunity to pour life, truth, and encouragement into my heart. When someone does that, I listen. Reading her words confirmed everything I know to be true. They were so good, in fact, that I felt compelled to share them with you. So what follows are Jan's words of encouragement to me after I was criticized by a mean mom. But I also thought it would be fun to collect the thoughts of some other Titus 2 women I know who are getting it right. After Jan's thoughts, take a minute to read some more encouragement from my friends Kate Battistelli (Francesca Battistelli's mom, ya'll), and Sally Clarkson. Note: It really would be helpful for you to read Tuesday's post first. Take a minute and then come back? Raising children is a loooooong process! We tend to view our precious ones in “snap shots” of time, but we’re really living an epic movie. The goal of godly, spiritually mature adults is still way out in front, and no one can (or should ever) be judged by one frame in a lifetime. It’s not a matter of “controlling your children," it’s a matter of training them. Again, a process. My favorite wisdom about this comes from my brother: “Make the right thing easy and the wrong thing hard.” Over time, they’ll get it. The woman whose words were so hurtful probably either has NOT raised her kids as well as she thinks, or she HAS and she’s taking credit for it, not recognizing the incredible grace of God to her. There is a mystery to how children “turn out," due in no small part to their own personalities and choices. The good Lord, our perfect Father, recognizes that children have a mind of their own—He gave it to us—and parents of little ones are not responsible for everything their children do (or don’t do). It's an amazing honor to raise children to serve the Lord. Those of us who've done it have survived the daily battles/joys/frustrations of parenthood and lived to tell the tale! Our job now is to encourage women younger than ourselves, to affirm they are doing a great job and also to remind them this mothering gig is not easy and it tests every bit of Christian virtue we think we have! As a mom with a grown child, I encourage older moms to help younger moms in these three ways. Remember. Try to remember what it was like when you were a young mom. We've been out of those days for awhile and just like the pain of childbirth, it's easy to forget what it's like when you're no longer in the trenches. It's easy to throw around cliched comments, easy criticisms and lame advice. It's far more fruitful to offer to lend a helping hand or a warm hug, time to talk and cup of tea. Take time to get to know the young moms. They need someone to tell them they really are doing a good job and sometimes they will make mistakes but it's ok and it rarely does any lasting damage to their children. Please don't constantly remind them how quickly their children will grow up. When you're in the day-to-day, believe me it doesn't seem as if it will EVER end, especially if you have toddlers or elementary-aged children. Cut them some slack and try to remember you didn't run a perfect household with perfectly behaved children either. Times have changed since we were moms. Technology exists today we didn't have. Cell phones, social media, the internet. These are all new and provide young moms unique challenges and distractions we never faced. Information continues to explode, the world is getting more confusing, not less, and they are facing temptations we never had to deal with. Be patient and be gentle. Our job is to help give them concrete examples of eternal principles as they raise their families. We teach by example, by modeling biblical womanhood. It's a process. We teach and admonish, correct when necessary (if we're given permission to speak into their lives), set a Godly example and be the woman they want to imitate. Live the truth and the truth is this: love rules! As a mother who has raised her children, my desire is to encourage and give hope to the mama’s who are right in the thick of the battle. God has not called me to judge young moms, but to help them. Having made so many mistakes along the way, and often feeling so alone in this great calling, I did not want other mamas to go the road without providing some encouragement, hope and help along the way. Motherhood is a very long-term journey. God intends that each child have someone devoted to them their whole lives—a mom! But each mom needs her own coach and cheerleader to walk beside her—to mentor her and to help her understand spiritual righteousness; to help her patiently love her children so that she will give emotional health; and to teach her to create a haven where the lives of their children might thrive in a loving, protected and stimulating home that the mom has created. Yet, today’s moms are supposed to do all of this without help or training or support systems—or next door neighbors to help her in times of need. All of us have good days and bad and lots in between. But the role of a Titus 2 woman should be to give hope, inspiration and training to the mom who feels alone in her home. One of my favorite aspects of Jesus’ words this year in my personal study is that He is “gentle and humble of heart,” and He then says, “Learn from me” (Matthew 11:29). When someone is humble, merciful, gentle, kind towards me, then my heart is open to learning from them, because I trust they will have my best in mind. However, if I fear I may receive more criticism or harshness, I will run far from that person. And so in the spirit of Jesus, let us come to each other humbly, in gentleness, to give hope, to walk as a shepherd tenderly caring for her sheep—as that is the picture I think Jesus gives us, so we may guide and encourage the mamas He brings into our lives. I'm so blessed by these precious women who truly get what it means to pour into the next generation. What a treasure they are to those of us still mucking through the trenches of motherhood. Thank you for being so loving and kind, ladies! Lord, my heart is hurting for those among us who don't have a real Titus 2 woman in our lives to help us walk through life with grace. So I want to lift those women up to you now, and ask you to meet this need in their lives somehow, some way. In Jesus' name. Desperate: Hope for the Mom Who Needs to Breathe (Sally's book co-written with Sarah Mae). Growing Great Kids: Partner with God to Cultivate His Purpose in Your Child's Life (Kate's book). *This post contains affiliate links. If you purchase something using them, I'll receive a small portion of the profit. Thanks for supporting my ministry! "Now faith is the assurance of things hoped for, the conviction of things not seen." Hebrews 11:1 ESV The one thing I don't want you to think is that I have it all together. Mostly, I'm a complete and utter mess...a mom, just like you, trying to keep her head above water in a crazy world that wants to take everything I have to offer. Some days I just want to give up, leave it all to chance, and hope things turn out OK. But several months ago, in a time of deep and intense prayer, God made it clear to me that my boys needed someone to fight for them, and that that person needed to be me. I don't always get it right, and sometimes I think I'm doing it all wrong. But I'm fighting. I'm giving this battle for their hearts everything I have, and trusting God to take care of the rest. But these things we're fighting for, they don't happen overnight. I wish when I looked my sons in the eyes—nose-to-nose and heart-to-heart—and shared the secrets to life, they would take root and produce fruit right away. Most of the time, they don't. Just today, my oldest let his emotions get away from him. By God's grace, I recognized it as an opportunity to reach for his heart, so I got down on his level, pulled him onto my lap, and asked, "Son, where do we go to find the truth?" "That's right, Son," I said, "we go to the Bible to find truth. It helps us to know the difference between right and wrong. Just now, you felt justified in acting the way you did, because you thought you were right. But the Bible tells us your response was very wrong. So if we think one thing is right, but the Bible says something different, who do we believe?" He looked down a little, and said, "the Bible." "That's right!" his happy mama said, "so if we feel we're right, but the Bible says we're wrong, who needs to change?" "We do," he said, and I hugged him tight, whispering in his ear, "hang on to that, Son. It will serve you well all your life." I left that conversation feeling great. But you know what? (I bet you can guess...) later this afternoon, we dealt with the same thing all over again. I used to feel like a total failure when these things happened, because surely if I mess up I'm a bad mom, and surely my kid is going to struggle with that issue for the rest of his life, right? Raising good, respectable, (and hopefully) godly children takes time. If we mess up there's new mercy for tomorrow, and certain struggles do get outgrown with time. But only a new day can make us believe it. Only the gift of time and perspective gives a mom hope to believe things will change, & strength to keep moving her feet toward that day (<<--tweet that). That's what faith is...believing that what we can't see, will be. Why? Because God's word never returns void, and the heart of a fighting mama is a heart that pleases God. So we keep fighting. Keep hoping. Keep reaching for their hearts. Offering all this as a gift to God...our way of serving him and making his name great with our own lives. Pray with me today, mama? Lord, I'm in this fight for the long-haul. I'm willing to give it all I've got for the sake of these souls you've placed in my keeping, and I'm going to trust that where I lack, you're strength will be made perfect. Be strong in me, Jesus, and in the process show my children the works of your hands. Amaze them with your love and provision. In your name I pray, Amen. Get your copy of It is Written today! Here it is, as promised. 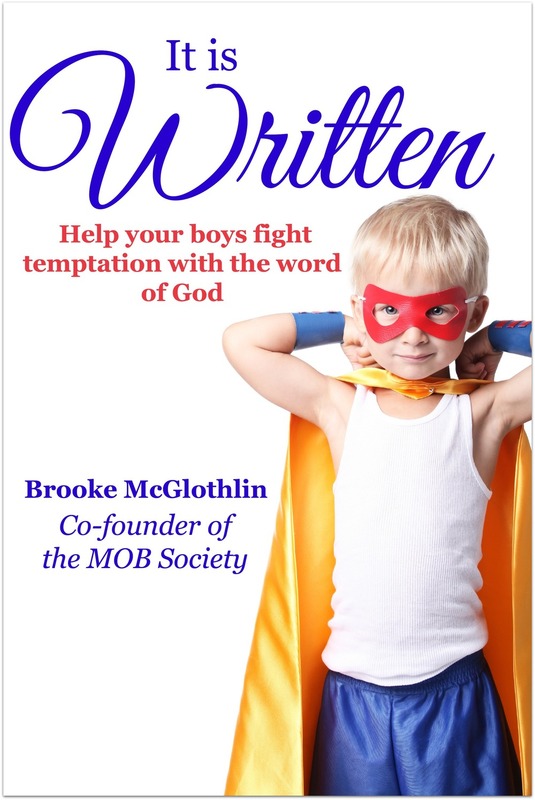 Go ahead and grab your copy of It is Written: Help Your Boys Fight Temptation with the Word of God, today! Just $1.99! Simply click the "add to cart" button below the image to make it yours. You know those conversations you have in your home over and over again with your children? They address some aspect of character that is sadly lacking in their hearts at the time, and tend to leave you feeling like you’re beating your head against the wall? We have them too. Most of the time they involve an effort to help the boys see the benefits of making wise, godly choices over foolish sinful ones. I talk about this concept briefly in Praying for Boys, but I've heard several of you mention that you'd like more help in teaching your sons to be wise men. It's one thing to tell them they need to make wise choices. It's something totally different to teach them how. <<--- Tweet That! Because this is something we're dealing with in our own lives, I created a resource for my boys to help them choose God's way over their own. I printed it out, and hung it in their room as a visual reminder that they have the power to choose. Then I thought to myself, "Self...maybe there are some other boy moms out there who would love to have something like this for their boys." And because I knew I was right (there I go talking to myself again) I pulled it together into a small resource that helps our sons learn to fight. It's called It is Written: Help Your Boys Fight Temptation with the Word of God. A deeper understanding of who the enemy is, and how we can best help our sons fight him. An easy-to-use explanation of temptation that kids will understand. Some hints to help you apply the concept of fighting temptation to your parenting without getting legalistic. A printable outlining ten common temptations and their biblical counterpart, with room for you to add in other key verses you find along the way (thanks to Small Bird Studios for the beautiful design). It is Written will officially go on sale tomorrow (2/5/14) for MOB Society newsletter subscribers at an intro price of just $.99! This is the best price you'll ever see for this resource! If you're already a subscriber, you'll receive a special email with a discount code on Wednesday. The intro price will end at 9PM EST on 2/6/14, and is only available for MOB Society newsletter subscribers. For everyone else (non MOB Society newsletter subscribers), It is Written will be available for $1.99 starting 2/6/14. You can come back here to grab your copy! You can get your PDF copy of It is Written tomorrow for just $.99 by subscribing to the MOB Society newsletter (if you're already subscribed, you don't need to do anything else), OR you can just wait until Thursday and grab it here for $1.99. What started out as one mom being fresh out of amazing, turned into a few blog posts between two weary moms. And those blog posts turned into a tiny little eBook, which then expanded and turned into a larger self-published book. And now, Hope for the Weary Mom: Where God Meets You in Your Mess, will be revamped, reworked, added to, prayed over, and released as a traditionally published book from Harvest House in January 2015. Stacey and I couldn't be happier to be working with Harvest House on bringing you a new season a Hope! They've been amazingly supportive of the message of this book already, investing not only in bringing you a new version of Hope, but also bringing you a 40-day devotional based on the book sometime in late 2015! Would you celebrate with us friends? Because we're so happy about our news, Stacey and I have decided to give away five PDF copies of the current Hope for the Weary Mom! To enter, just fill out the Rafflecopter below!